Pumpkin with halloumi, tomato sauce and lots of flavors! Last week, we had guests for dinner. I was doubting what to serve, my thoughts were going everywhere, unable to decide. Until an hour before the guests arrived, I still hadn’t made up my mind! With a slight feeling of panic in my stomach, I finally decided to go only for what I wanted that day meaning a bit of everything; healthy with veggies in the leading part, a lot of flavors, simple, cheap, with ingredients that already were to be found in my kitchen and fast (it just had too, the guest would almost arrive by then…). Below is the result. After serving it 3 times this week, I think I can call it a rather successful dinner! To have it ready within 40 minutes, you just need to plan the different elements in time and you can still be a fantastic hostess without sweat on your forehead. Don’t be shocked by the long list below, it is really simple! (Za’atar is a herb mix from the middel eastern with ground dried thyme, oregano, marjoram mixed with toasted sesame seeds, and salt. Sometimes sumac is also added. I have written the different elements in the order as I recommend you to do it to be able to get it ready as relaxed as possible (meaning before the guests arrive). 1. Set the oven on 210º C.
2. Cut the pumpkin in 2 parts and separate the seeds. I never bother to peel the pumpkin! Slice the pumpkin in slices of 1 cm. 3. Place the slices on an oven tray and sprinkle with olive oil. Sprinkle za’ataar on top. “Massage” the olive oil and za’ataar al over the pumpkin to cover it completely. 4. Place the oven tray in the oven and set the timer for 25 minutes. After 25 minutes, turn each slice of the pumpkin and place again the oven tray in the oven. Set the timer again for 20 minutes. See that the pumpkin doesn’t burn! 1. Cut the onion and the garlic clove fine. 2. Melt the coconut oil in a deep pan and add the onion and garlic. Fry on a low heat until transparent, it shouldn’t get any color. 3. Add the rest of the ingredients to the pan and let it simmer on a low heat for about 35 minutes. Stir every now and then to avoid burning. 1. Let the chicken stock come to a boil. 2. Add your cleaned chicken fillet to the boiling stock. Let it cook on low heat for about 30 minutes to make sure it is cooked through and through. 3. When serving, slice the fillets from the short side and place beautiful on a plate. Sprinkle with Maldon salt, a good olive oil and some gremolata. Keep the rest of the gremolata on the side for each one to serve themselves. Place a dry skillet on your stove, add the pumpkin seeds to it and roast the seeds until they start to “pop”. Turn them around with a wooden spatula. When golden, pour them oven into a bowl and let them cool off until serving. Chop up parsley leaves (including the stalks) and garlic fine and mix it with grated lemon zest. Pour over everything in a bowl and mix well. If you want to be absolutely sure that the it keeps fresh; wet a doubled kitchen paper, squeeze the water out and cover the gremolata with it until serving. Wash and cut the salad if needed. Place in a big bowl. Slice the avocados and place in a separate bowl. 1. Cut the halloumi in slices (1/2 cm thick). 2. Melt the coconut oil in a skillet. Place the slices of cheese in the pan and fry on a medium heat until golden. Turn them around and bake on the other side. 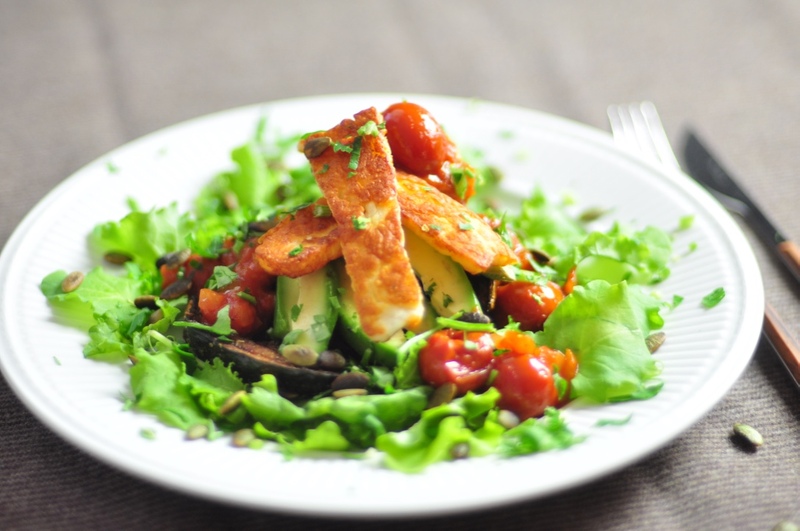 When ready, place the halloumi on a plate and go on baking until everything is done. Serve as soon as possible after finished with the baking. Serve the dishes in separate bowls, making it possible for each one to create their own favorite plate. Sprinkle the roasted seeds and gremolata on top of everything. A glass of red wine to go with it is really good! Thank you, it is really SO good! After reading about Gremolata from your post above, I was intrigued, never having heard of it before. We still have an abundance of fresh itallian parsley in our Seattle garden and lemons and garlic from the market this weekend so we made a bowl. Wow! Such a a flavor zinger! We sauteed diced carrots and half moons of green and yellow summer squash in butter, and tossed with pan toasted blanched almonds and lots of the Gremolata. In our mouths, it was though it was midsummer again, wonderful! Thanks for expanding my food lexicon Isabel!